Technology Can and DOES Change our Relationships; for the BETTER! I like the concluding recommendation in this article and this TED talk by Susan Turkle for learning to love yourself better by being comfortable with and appreciative of solitude. However I think that Turkle's TED talk and her new book Alone Together,make a fatally flawed assumption that using things such as texting and social media are eliminating our alone time and that our virtual means of expressing our emotions are replacing the real ones and lessening our human connections. I simply don’t buy into Turkle’s assumptions that we are letting technology "take us places we don't want to go." and her conclusion that"The little devices in our pockets are so psychologically powerful that they don't eve change what we do, they change who we are." Sorry Susan, but in my experience and observations at least NO! this is NOT necessarily so and WE as fundamentally social animals decide how, when and where to use tools and technology . While learning to choose the best tool for the job and how to use it well is a big challenge that takes time and lots of experiential learning to figure out, and this is an exponentially increasing learning curve in our world filled with such abundance of choice, most of us DO figure it out and are all the richer for it in terms of improved connections with the other special snowflakes we chose to include in our lives. Some of us are slower to learn than others and we pay lots of “stupid tax” in the wonderful cycle of try/fail/learn/adjust/repeat, but this tax amounts to less than a rounding error in the overall net value we gain through such learning. While I understand that there are some glaring examples of poor choices we make along this learning curve which gossip and the media focus on, based on my experiences and observations, these examples are by far the vocal minority and represent a small extreme end of the spectrum of human behavior. Surely by now we understand that such examples and “failures” are necessary components of learning and improvement and we should see them as positive things we want more of not less in our quest to continuously enrich our lives with greater breadth and depth of connections with both ourselves, our friends and our families?! History shows that we make this same mistake over and over again where the pundits proclaim the arrival of new tools, technology and media are going to eliminate those that came before. TV was going to eliminate radio, flight was going to eliminate trains and automobiles, eLearning was going to eliminate teachers and so on. While new innovations clearly have a significant influence on what came before, (when was the last time you sat around with friends or family listening to the radio?? ), the new hardly ever eliminate or replace the old. Our world is much more one of a giant Boolean Add equation than one of subtraction or reduction. The new and sometimes daunting challenge as we acquire more and more tools in our toolbox is to know how and when to use the right tool for the job. When is a Tweet or a FB update the best choice? When is an Email or a phone call better? When best to wait for the chance to meet in person and what to do in the interim? I concur and hope that we will always prefer in person human contact over more distanced and removed virtual forms, but surely we would also want to augment the limited opportunities we have to be with those we love and care about with every possible means to converse, share, love and learn with them. And as our tools and technology continue up the exponential curves increasing capabilities and decreasing costs, not too how the tools become more and more transparent and the connection we have with others becomes the focus. Does it matter HOW an emotional personal connection with another human happens or that these happen more often for all 7+ billion of us snowflakes? Turkle posits that our increased use of digital technology to converse with each other is lessening our ability to self reflect. Seriously? For me at least it has produced the exact opposite effect and something I’ve blogged about several times on my Learnativity blog as I try to reconcile how I can have so many deeply rich experiences in my day to day live in such a very short time. It is an effect I have called ELD or Exponential Learning Density which I believe is created by a cycle of living IN the abundance of moments life offers us every day, then reflecting upon these and then sharing our thoughts, questions, feelings and learnings with others. My conclusion is that by repeating this cycle of Live-Reflect-Articulate I end up with this extreme “density” or rich learning experiences and a life that is filled with non stop adventures, interactions with others and Mother Nature and more love, life and learning every day. As I reflect back on how filled with rich experiential learning my life is, I still can’t quite comprehend I’m only just starting my fifth year on this grand sailing life adventure! As one who perhaps has more solitude than most as I wander, wonder and ponder the world one nautical smile at a time single handing my sailboat around the planet, I can offer at least one shining example where I use the entire plethora of means at my avail to express my thoughts, feelings and emotions with the many friends and family who I am blessed to be surrounded by. When I’m with others I meet out here or on my trips back to see friends and family, I’m as good and frequent a hugger as you’ll ever meet, I’m as comfortable kissing men as women (on the cheek/forehead) who I love and care for when I’m given the gift of the opportunity to be with them in person. If I shake your hand, clink glasses with you or talk to you, I will be looking deep into your eyes. However to the best of my knowledge all these people in my life also feel my love and caring for them more often as I use a vast array of tools and technology.that augment my abilities to connect with them. All of these additional means are “virtual” through the use of the increasing abundance of communication choices I have. I care SO much less about the means through which I get to express and share with others as I do with ensuring that we have more and more opportunities to share our lives, learning and love with each other. So let’s please keep our eyes on the prize and not mistake the means we use with the end results of deeper human connection, commitment and conversation and ensure that what we have the most abundance of is Life, Love and Learning! We Snowflakes are all made of Stardust!! I learned one of the most amazing things yesterday and just had to share it with the rest of you in case you didn’t know this either. Every atom in your body was once inside a star that exploded! That means that each of us snowflakes are made of stardust!! How awemazing is THAT?!?! I learned this yesterday while pursuing one of my current curiosity threads about space time continuum and the cosmos and reading “A Universe from Nothing” by Lawrence Klauss. (highly recommended) Klauss explains how the heavier elements such as nitrogen, oxygen, iron were NOT made by the “Big Bang”. These heavier nuclei elements can only be made with truly huge energy levels and heat, much more than even during the Big Bang. The only place there is enough energy and heat to form these heavier atomic elements is during the rare occurrence of an exploding star called a supernova. A supernova burns for about a month with the brightness of 10 billion stars! This only happens about once per hundred years per galaxy, but then again there are billions of galaxies so there are still quite a few of these overall. (about 200 million in the history of our galaxy). What this means then is that the only way these elements could get into our bodies is if these stars were kind enough to have exploded and sent their products hurtling out into the cosmos, some of which eventually arrived at the blue marble called Earth. “we are all, literally, star children and our bodies are made of stardust! Sorry, I’m fascinated by so many things and even without the assistance of my ADD riddled brain I’m sure I would be just as easily excited by the awesomeness of the world around me. I’m still reeling in amazement of just how poetic and powerful and humbling it is to learn that each and every one of us snowflakes are made of stardust. I’ve described some of my many experiences of looking up into the night sky while out here sailing around the world on my Learnativity blog. The perspective you get when you are out in the middle of the deep blue sea with no land in sight is a unique life experience as the sea and the sky merge into one and surround you completely. It is an awemazing experience with a spiritual like quality as you feel a profound connection with the world around you and become one with it. You are no longer a mere external observer, you are a part of this big picture. Regular readers know that I live using serendipity and synchronicity as strategies and guides so it came as no surprise that this morning, as I was typing up this post and catching up with Emails, Facebook updates, notes, etc. (ADD remember!) I stumbled over a post that my friend Tina in Newfoundland Canada had posted to FB about her discovery of the exact same fact that we are all made of stardust. Her source was Astrophysicist Dr. Neil DeGrasse Tyson and was his answer to the question “What is the most astounding fact you know?” Better yet, Tina included this great video (must watch!) and moreso, she posted all this at literally the same time I was reading my book! Thanks Tina! I used to have the problem of keeping my jaw from bouncing off the steel desks of my sailboat when my mouth gaped open as I looked up and out at the night sky which is now almost every night in this charmed life I lead, but I just lay down and look up now so my jaw doesn’t hurt so much. I have similar feelings when I’m snorkeling and experience those moments when I become one with that undersea world in these areas where all the other life forms wondrously ignore me. But last night, as I looked up into the clear night sky and those billions of stars shining down on my here in Fiji, it was somehow even more amazing now that I know that not only am I part of the universe but it is a part of ME! Maybe you already knew about this and I’m just slow to learn as usual but if we are not all amazed by things like this and the beauty that surrounds us EVERY day, then I think we are just not paying attention and not living up to our responsibility to live this gift of life well. One of the sadder points of 2010 was the loss of a great learning leader and colleague, Jonathan Kays. For an all too brief time Jonathan was the Chief Learning Officer of the Masie Center’s Learning CONSORTIUM after following a long career with the Central Intelligence Agency, including a stint as their first CLO. However our loss has also resulted in much gain as my long time friend and colleague Elliott Masie inspired and pulled together a fascinating collection called “Learning Perspectives 2010” in memory and commemoration of Jonathan. This collection of “Over 40 learning leaders from global corporations and government agencies contributed perspectives on how learning is changing (and will continue to change) in the coming years” is as eclectic as it is excellent IMHO. I’ve long since departed the USA and resumed my life of constant adventure aboard the good ship Learnativity* and have been reading and re-reading more of the articles in Learning Persepctives 2010 as I float out here in the tropical atolls of the Marshall Islands. As I’ve been doing so I thought many of you might also enjoy starting off your new year being inspired by some of these articles and by Jonathan’s legacy and hence this post. As another gift to yourself courtesy of the Masie Center I’d encourage you to go check out the enormous collection of even more great content including lots of video and audio from the Learning 2010 conference that is all available at www.learning2010.com Even if you’ve been there previously it is worth return trips as there have been lots of additions in the last two months. I was humbled and honored to be asked to submit some content for this tribute to Jonathan and I’ll be posting some out takes from that in the coming weeks here to stimulate some additional comments from you and inspire me to add more of my own so please stay tuned for those. Wherever this note may find you today I hope that 2011 is floating your boat as well as it is mine and look forward to another fun year of learning, loving and living. Country or Community or Neither? Maps are such a big part of my life as I experience the world via my sailboat so the TechCrunch posting XKCD Updates Its Map: We No Longer Live In Actual Countries But Digital Ones provided some serious fun for me this morning looking at this updated map for 2010 and this previous 2007 Map of Online Communities from XKCD. These maps show online communities as countries with size based on the volume of daily social activity. It is both a fun perspective on the world we live in and very useful to support the trend I’ve been talking about for many years that the whole notion of national boundaries is fading fast relative to their importance and relevance in our daily life. Let me be quick to point out that I am not in any way suggesting that national boundaries will be eliminated or forgotten nor that we will be any less proud of your national heritage. But in terms of what matters in our daily lives as we go about living, learning and working together I think we are all seeing more and more examples where national boundaries matter less and less. The country of origin of a person, product or service matters less and less to us compared to their fit and match to our unique needs and preferences. Think about it, in your conversations and correspondence over the past week which have you mentioned more often; what country you are from or what online community you are from? I would also point out a related pattern that the importance of and the differences between the physical and the digital, between the real and the virtual, between the geographic location and the online location, are also becoming less and less relevant and distinct. We can and should start dropping them as qualifiers in our conversations. Just like we are less likely to feel the need to point out that we are calling someone from our car or an airplane and focus on the conversation at hand, we will have less need to add that some thing, or even some one, is digital or online or Canadian and focus more on having the right people and things connected together at the right time and way to meet the unique needs of the moment. Perhaps more importantly it seems to me that communities matter more than countries. I don’t see this as anything uniquely modern or new or digital. Reflecting back on human history one could argue that communities have often been more important than nationalities. What is new however is the reduced need to factor things like location or nationality or digital into our daily decisions. They are not irrelevant, just less relevant. Taking an even longer view, which is my nature, I see all single point categorization such as nationality, gender, age group, digital, real, and so on, fading in importance and relevance as we instead use these as bits of metadata or characteristics which number in the hundreds, millions and centillions (10600) and which we combine into mashups and mine to help us make faster better decisions and help us avoid stereotyping and other forms of mass production thinking. While not without new problems and challenges I for one see all these changes as a VERY good thing and a major step forward by providing more ways and opportunities for all of us to help make this a better world to live, love and work within. In any case, have fun wandering and pondering these maps. Several in fact; check out the two videos below from Steven Johnson, consider reading his new book “Where Good Ideas Come From: the Natural History of Innovation” and see if these help you generate more good ideas of your own. I also love these RSA video animations like the first one below which are intriguingly from the Royal Society for the encouragement of Art and are an extremely effective way of presenting ideas and concepts. If you’ve not seen one before I think you’ll enjoy not only the topic but the presentation style itself and you’ll find lots of them available on YouTube and elsewhere if you start searching. But my real purpose of this post was to bring your attention to this provocative pursuit of the challenging question “Where do good ideas come from?” and a book which Steven Johnson has recently released after his five years of his pursuit from an environmental (our surroundings) perspective. The presentation and the book provide the patterns he has gleaned from his research and observations. I particularly liked his his notion of “creating spaces where ideas can mingle, swap and create new forms”. And as a real serendipity and Lego block kind of guy I was particularly drawn to Steven’s thoughts on good how good ideas are formed by the collision of smaller hunches and the cognitive catalyst of serendipitously stumbling over some rich bit of new information. He notes that what we’ve been seeing, over the past six to eight hundred years, is the historic rise in connectivity to reach out to other people and borrow their ideas and hunches and let them collide with ours and create something much bigger than the sum of these hunches themselves. Check out these videos below and see if they don’t provide some great cognitive collisions with some of your hunches and ignite some great new ideas that you can share with the rest of us and keep this cycle ever growing and widening. * NOTE: I’ve just discovered that due to technical difficulties and user error this article I wrote back in August did not get posted here on OCOT as I had thought. It did make it to my Learnativity blog and provoked the most comments and Emails of any posting this year I think and remains a topic of great interest to me and one I will be writing much more about in the coming months. Hope you enjoy it and look forward to your reactions and comments. I am very excited to be finally writing this article for you because I think I’ve stumbled upon a very simple two part model which I believe can dramatically increase the effectiveness of our learning and help us all get the very most out of each of life’s experiences. Ambitious? Yes! True? You tell me. For lack of a better title I’ll refer to this “Experiential Learning Density” or ELD and I’d like to share my thinking with you here, both in order to provoke your reactions and see if you too think there might be something very powerful about what we can learn from this. As simple as this model is, I must warn you in advance that is will take me a while to explain how I have come to discover this ELD model and my initial understanding of how it all works. I do believe it will be well worth your time, and in fact the concept of time is where I will start. For as long as I can remember, I’ve been fascinated by the whole concept of time and it continues to intrigue me more every day. Can time stop? Why does time past seem shorter than time forward? Is time travel possible? You get the idea. From my limited understanding of time from a scientific and mathematic perspective, it seems that time is one of the only absolute constants we know of. Even though we all know that an hour is an hour a year is year, have you also noticed how our perception of time is asymmetric as we consider an amount of time in the future compared to the same amount of time in the past? For example doesn’t it seem that when you find out a song or a movie or a book you really like was originally released ten years ago that your reaction is “No, really? I thought it was just three years ago.” And yet when you think of what it will be like ten years in the future, the year 2020 as I write this, doesn’t that seem like such a longer amount of time compared to those same ten years of the past? All this to say that the second part of the background for you is a very recent understanding I’ve come to about time and this notion of “experiential learning density” or ELD for short. March of this year (2010) marked the beginning of my third year out, as I put it, “wandering, wondering and pondering the planet one nautical smile at a time” as I explore this incredible planet from the perspective of the world’s oceans aboard my sailboat, the good ship Learnativity. At that time I was onboard Learnativity in Whangarei New Zealand waiting for the end of the hurricane season up in the South Pacific and busy getting her all ship shape for the new season. Today, August 7, 2010 I’m writing typing this up for you from the cockpit of Learnativity in the middle of my three day passage from Futuna Island to Savusavu in Fiji. One of the great things about living on a sailboat is that you have lots of time for reflection as you look after the seemingly endless list of things to do and also while out sailing on the long passages. And as I reflected on this milestone I could not believe that it had only been two years since I sailed out from under the Golden Gate Bridge to embark upon this grand adventure. I mean I literally could NOT believe it. I must have checked my calendars and other records at least a hundred times in the course of that month because I was sure I had to have the dates wrong. As I started to recall even a short list of some of how many incredible experiences I had and how much I learned in that time; the places I had been, the incredible people and cultures I had been privileged to be a small part of, new languages and skills I’d learned and the friends and family who had joined me for parts of it, I became more and more convinced that it was simply not possible that all this had happened in the span of only two years. Even more so when I added up all the times when I had either been in just one spot for several months such as El Salvador, Costa Rica, Polynesia and now over six months in New Zealand, or the number of occasions when I’d left the boat for weeks or more to fly out and look after some business engagements or family affairs such as my daughter’s wedding last August. Surely it had been five or ten years?! I couldn’t stop picking this apart and it quite consumed my thinking as I tried to comprehend how it could possibly be that my “experiential learning density” or ELD could possibly be SO high in such a short time. But in the past few months as I’ve continued to work on this conundrum I think I am coming to understand how this works and I wanted to share this with you in case it is as I believe it is, something you can use and how I believe there are some common practices we can use to increase our ELD for greater good and gain both individually and collectively. The first of the two parts of this ELD model involves what I’ve been learning during my grand sailing life adventures is how to truly “live in the moment” and by so doing, get the very most amount possible from any given experience in life. This is something I practice as much and as often as I can and try to get better and better at doing so every day. For me, living in the moment is about being profoundly “present” in each moment of an experience. One lesson I’ve learned from this which might help you understand my context is that if you are busy capturing the moment you are not IN the moment. By capturing I mean by taking photos or video, or by writing notes or texting about it or telling somebody about it on the phone. I recall learning about this a long time ago back in my university student days, when a good friend of mine who was a very skilled amateur photographer and was constantly being asked to take photos of our other friends who were getting married in those years. One day he suddenly announced that he was no longer available to be the wedding photographer. When I asked him why, he said something that has stuck with me ever since when he explained that he was tired of missing out on all his friends’ weddings , because if he was busy photographing the wedding, then he wasn’t attending and sharing in the wedding!. Brilliant observation and decision I thought. Most recently, in fact while I was on my boat in New Zealand, I had a very related experience while I was sitting up in the cockpit enjoying the early morning sunrise and some breakfast. It was spring time “down under” and a mother duck and her new brood of ducklings came swimming by and stopped a few feet away from me at one of the mooring poles I was tied to. These poles have rubber tires slipped over them where you tie your lines to so that they and your boat float up and down with the tide and maintain the right amount of slack. My first thought was to jump up and get my camera to capture this great early morning spring scene, but I realized that by the time I got my camera they might be gone and here is what I would have missed. There were six ducklings and four of them managed to flap and scramble their way up on top of the floating tire, one just swam around it and the other stayed by Mom’s side. Of the three on top of the tire, one jumped into the water in the space between the tire and the pole, one stayed on the edge contemplating joining him and the other jumped back off the tire and joined his other sibling. Wow! What a microcosm of life in under two minutes! As I watched this all unfold in a matter of two minutes or less I realized what a simple yet powerful example this was of “living in the moment” and how I had been able to do so by resisting the temptation to try to capture it and not be “present” for the experience itself. When I wrote this story up in my blog entry that day I simply found a public stock photograph of a mother duck and six ducklings and used it to illustrate the story. However, lest you misunderstand, let me be very clear that reflecting upon and capturing our experiences is a critical component and the second part of the two part ELD model. Here is how I think this all works; ELD or just learning perhaps is a constant cycling between time spent living in the moment, followed by time spent on reflection, capturing, learning and sharing. (I see these as all parts of one thing) Rinse and repeat. Repeat the Cycle, Improve, but DO NOT BLEND TOGETHER! For the first part, living in the moment, I am afforded the great luxury of having a seemingly infinite plethora of profound personal experiences as I sail through this life and what I’ve been working on is getting better at being truly present and living IN each of these moments. It isn’t as easy as it sounds. It takes a lot of energy and can be exhausting, though in a very good way. Living in the moment isn’t something I think most of us are good at on a regular basis. Too many distractions, too many things to fit in, too much temptation to “multi task”, which IMHO is one of the greatest myths and misguided goals of all time. It is my observation that by trying to pack more into the finite amount of time we have, we are actually accomplishing less, experiencing, less, contributing less and living less. Like most of you I suspect I am putting more time and energy into reflecting, capturing learning and sharing from my experiences. Consider for example the exponential explosion of the number of photos and video so many of us are taking and uploading, the amount of writing we are doing in the form of Emails, blogging, texting, Tweeting and podcasting. And the degree to which we are sharing all this so broadly and freely via so many means and social networks. While you can argue that much of what is being shared is trivial or otherwise less than valuable, it is all in the eye of the beholder right? We do it partly for ourselves, but we also seem to enjoy and learn from what others are sharing which prompts and provokes more reactions and new actions ourselves and to build upon the work of others which creates an exponentially compounding cycle. As simple as these acts of capturing our thoughts and our experiences may be, it tends to require us to be more reflective, to consider what is worth sharing, and to ask what did I learn today? And to then capture this in some form that can be communicated with others who are doing likewise themselves. What is key, and what I think we have NOT been doing, is separating these two critical skills and acts. As per my comment in the beginning of this article, if you are busy capturing, reflecting and sharing a moment you are not living IN the moment. Maybe this is all as old as time itself for all of you and I’m just my usual slow learning self. But for me, this is how I’ve come to understand why I have been having such an extraordinarily high degree of experiential learning density in my life of late, and how I plan to continue to ride that exponential curve upwards. I’ll let this conclude my time for reflecting and capturing this for today and I look forward to receiving your thoughts, reactions, comments and critique on all this. Meanwhile as this text is busy uploading itself via my sat phone connection so I can share it with you; I’ll now flip back to the first part of the cycle by and put my energies into living in the moment that is a gorgeous sunset out here in Nanuku Passage in eastern Fiji! What's the best way to motivate people, based on recent research? We'll get to that in a moment. But first—is this even a smart question? Not really. The question assumes a one-size-fits-all, best solution. That's a common trap when problem-solving. I’ve long been fascinated by the whole field of emergent behavior and its links to serendipity and personalization. With thanks to Harold Jarche (@hjarche), a fellow Canadian and serendipitous learner, for serendipitously finding and passing this set of examples on in his recent Tweet. I can heartily encourage you to spend some time playing with several of the interactive examples that are linked in the article below. but reflect on this and then go convince yourself by doing some experiential learning with the links to several fun activities in the article. I often bring up this point and these examples when evangelizing the power and value of The Snowflake Effect and why I find simple examples such as LEGO blocks to in fact be very powerful metaphors as to how we can indeed have the infinite scalability that mass customization and personalization requires. Think too for example how all the music in the world is based on a small number of notes and simple rules. Please do take the time to try out some of the fun examples you will find in the linked article below and I think you too will be amazed at just how quickly complex behaviors emerge from such simple rules. Many complex systems are based on simple rules. A set of several simple rules leads to complex, intelligent behavior. While a set of complex rules often leads to a dumb and primitive behavior. There are many examples. 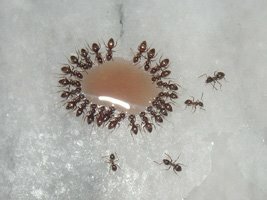 How ants search for food? They do not have cell phones, cars and mini-markets near the nest. They should have something simpler to communicate. Travel randomly in search for food. Take a piece of food and head straight back to the nest. On the way back to the nest lay down an odor trail. Notify nestmates of the discovered food encouraging them to leave the nest. These newly recruited ants will follow the odor trail directly to the food source. In their turn, each ant will reinforce the odor trail until the food is gone. Sounds simple? Take a look at this very nice ants colony model. Drop some food and enjoy the action. Tired of my constant use of LEGO blocks in my analogies? Want to get some hands on experiential learning with what it will be like to do DIY nanotechnology design in the near future? Want to make some magnetic snowflakes? Of course I treat most things as metaphors and analogies and convert most to concepts and so for me these are a great way of learning to truly think and see things differently. When you start to see how things can be both fluid, liquid or plastic like when you want to shape them and then snap into something more solid when you have the shape you want, I think your mind actually starts to work differently and better. So I see these magnetic balls as a very powerful way of having some serious fun. Do a search on YouTube and you’ll find LOTS more examples of what others are doing with these amazing magnets, but of course the best designs and learning will be from trying them out yourself. PS. In case there is any doubt NO I am NOT affiliated with these products in any way. I just think they are cool and a true learning object! Most Likely to Succeed? Is it possible to predict & hire great teachers? How do we hire when we can’t tell who’s right for the job? I really enjoy Malcolm Gladwell's writing and more so his curiosity and how he "thinks different". I try to read as many of his columns as I can as they find a sweet spot for me of being long enough to explore a topic in some depth and let him tell a good story, yet be short enough that I can read them in one sitting along with the many other articles and posts I'm reading each day. This New Yorker article focuses on the very tricky art of hiring practices, especially for teachers and exposes a lot of common myths about hiring and spotting of true talent for a given job or task. You'll need to make it through his initial telling of the challenge in American football he refers to as "the quarterback problem" before you will get to his comparison and coverage of the importance and challenge of how to choose good to great teachers. However it is well worth your time and I highly recommend reading the full article and see what you think and take away. At the risk of spoiling the story for you, Malcolm makes that point that effective hiring practice for complex and critical roles such as teachers takes years and requires observation of the results achieved over this time. This would suggest an apprenticeship type model and a radical shift from the way we currently recruit, reward and retain great teachers. To be effective we need to treat each teacher as a unique individual and hire at this same level of uniqueness; one at a time. Many would therefore probably place this into the "impossible" category but as you can likely guess I'll add it to my "What if the impossible isn't?" list. And indeed Malcolm goes on to describe at least one example, financial planners, where this is both possible and being practiced. For me this is yet another example of why we need to treat each situation, each job and each person as a unique individual. Hence I see this, no doubt through my frosted glasses, as another excellent example of why The Snowflake Effect is so important and how it is affecting almost everything in our world. "with enough data, it is possible to identify who the very good teachers are and who the very poor teachers are. What’s more—and this is the finding that has galvanized the educational world—the difference between good teachers and poor teachers turns out to be vast." "Teacher effects dwarf school effects: your child is actually better off in a “bad” school with an excellent teacher than in an excellent school with a bad teacher. Teacher effects are also much stronger than class-size effects. ""After years of worrying about issues like school funding levels, class size, and curriculum design, many reformers have come to the conclusion that nothing matters more than finding people with the potential to be great teachers. But there’s a hitch: no one knows what a person with the potential to be a great teacher looks like. ""Test scores, graduate degrees, and certifications—as much as they appear related to teaching prowess—turn out to be about as useful in predicting success as having a quarterback throw footballs into a bunch of garbage cans." "The equivalent of that approach, in the N.F.L., would be for a team to give up trying to figure out who the “best” college quarterback is, and, instead, try out three or four “good” candidates. In teaching, the implications are even more profound. They suggest that we shouldn’t be raising standards. We should be lowering them, because there is no point in raising standards if standards don’t track with what we care about. Teaching should be open to anyone with a pulse and a college degree—and teachers should be judged after they have started their jobs, not before. That means that the profession needs to start the equivalent of Ed Deutschlander’s training camp. It needs an apprenticeship system that allows candidates to be rigorously evaluated." "What does it say about a society that it devotes more care and patience to the selection of those who handle its money than of those who handle its children?" I hope you will take the time to not only ready this article but to reflect upon it and contribute your reactions and ideas. Is it possible to hire and retain great teachers? Is it possible to raise the quality of teaching staff overall? Would this "apprenticeship" type of model work for the teaching profession? "A prediction, in a field where prediction is not possible, is no more than a prejudice."